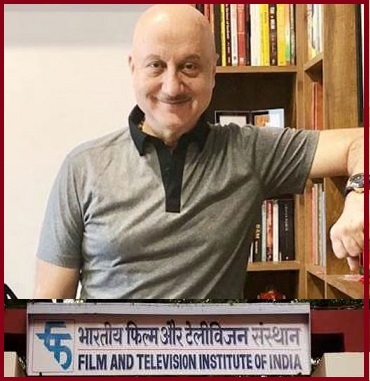 Veteran actor Anupam Kher (62 years) on 31st October has resigned from the post of Chairman of the Film and Television Institute of India (FTII) situated in Pune. Anupam Kher took office as the Chairman of the prestigious organization on 10th October 2017. Prior to Anupam Kher, Gajendra Chauhan was the Chairman of FTII. Chauhan left office in March 2017. Anupam Kher offered his resignation through a letter citing upcoming assignments of films and television. In span of Anupam's 35 years acting career, he has appeared in over 500 films and many plays. He is best known for his roles in Saaransh, Daddy, Ram Lakhan, Lamhe, Khel, Dilwale Dulhania Le Jayenge, Maine Gandhi Ko Nahin Mara, and A Wednesday among others. FTII is premier institute in India that provides training for acting, film-making, video editing, direction, and production. FTII is an autonomous body under the Ministry of Information and Broadcasting.It was established in 1960 and is situated in Pune on the premises of the erstwhile Prabhat Film Company. Since its inception, FTII has become India’s premier film and television institute. Its alumni have become technicians, actors, and directors in the film and television industry.